Piezoelectricity - How does it work? | What is it used for? by Chris Woodford. Last updated: August 21, 2018. You've probably used piezoelectricity (pronounced "pee-ay-zo-electricity") quite a few times today. If you've got a quartz watch, piezoelectricity is what helps it keep regular time. If you've been writing a letter or an essay on your computer with the help of voice recognition software, the microphone you spoke into probably used piezoelectricity to turn the sound energy in your voice into electrical signals your computer could interpret. If you're a bit of an audiophile and like listening to music on vinyl, your gramophone would have been using piezoelectricity to "read" the sounds from your LP records. Piezoelectricity (literally, "pressing electricity") is much simpler than it sounds: it just means using crystals to convert mechanical energy into electricity or vice-versa. Let's take a closer look at how it works and why it's so useful! Photo: A piezoelectric actuator used by NASA for various kinds of testing. Photo by courtesy of NASA Langley Research Center (NASA-LaRC). Piezoelectricity (also called the piezoelectric effect) is the appearance of an electrical potential (a voltage, in other words) across the sides of a crystal when you subject it to mechanical stress (by squeezing it). In practice, the crystal becomes a kind of tiny battery with a positive charge on one face and a negative charge on the opposite face; current flows if we connect the two faces together to make a circuit. In the reverse piezoelectric effect, a crystal becomes mechanically stressed (deformed in shape) when a voltage is applied across its opposite faces. Think of a crystal and you probably picture balls (atoms) mounted on bars (the bonds that hold them together), a bit like a climbing frame. Now, by crystals, scientists don't necessarily mean intriguing bits of rock you find in gift shops: a crystal is the scientific name for any solid whose atoms or molecules are arranged in a very orderly way based on endless repetitions of the same basic atomic building block (called the unit cell). So a lump of iron is just as much of a crystal as a piece of quartz. In a crystal, what we have is actually less like a climbing frame (which doesn't necessarily have an orderly, repeating structure) and more like three-dimensional, patterned wallpaper. Artwork: What scientists mean by a crystal: the regular, repeating arrangement of atoms in a solid. The atoms are essentially fixed in place but can vibrate slightly. In most crystals (such as metals), the unit cell (the basic repeating unit) is symmetrical; in piezoelectric crystals, it isn't. Normally, piezoelectric crystals are electrically neutral: the atoms inside them may not be symmetrically arranged, but their electrical charges are perfectly balanced: a positive charge in one place cancels out a negative charge nearby. However, if you squeeze or stretch a piezoelectric crystal, you deform the structure, pushing some of the atoms closer together or further apart, upsetting the balance of positive and negative, and causing net electrical charges to appear. This effect carries through the whole structure so net positive and negative charges appear on opposite, outer faces of the crystal. The reverse-piezoelectric effect occurs in the opposite way. Put a voltage across a piezoelectric crystal and you're subjecting the atoms inside it to "electrical pressure." They have to move to rebalance themselves—and that's what causes piezoelectric crystals to deform (slightly change shape) when you put a voltage across them. Normally, the charges in a piezoelectric crystal are exactly balanced, even if they're not symmetrically arranged. If you squeeze the crystal (massively exaggerated in this picture! ), you force the charges out of balance. Now the effects of the charges (their dipole moments) no longer cancel one another out and net positive and negative charges appear on opposite crystal faces. By squeezing the crystal, you've produced a voltage across its opposite faces—and that's piezoelectricity! What is piezoelectricity used for? 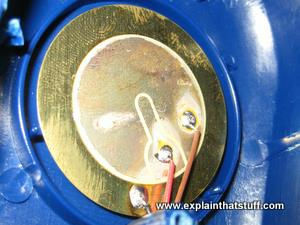 Photo: A typical piezoelectric transducer. This one is the ringer inside my landline telephone: it makes a particularly shrill and horrible chirping noise when the phone rings! There are all kinds of situations where we need to convert mechanical energy (pressure or movement of some kind) into electrical signals or vice-versa. Often we can do that with a piezoelectric transducer. A transducer is simply a device that converts small amounts of energy from one kind into another (for example, converting light, sound, or mechanical pressure into electrical signals). In ultrasound equipment, a piezoelectric transducer converts electrical energy into extremely rapid mechanical vibrations—so fast, in fact, that it makes sounds, but ones too high-pitched for our ears to hear. These ultrasound vibrations can be used for scanning, cleaning, and all kinds of other things. In a microphone, we need to convert sound energy (waves of pressure traveling through the air) into electrical energy—and that's something piezoelectric crystals can help us with. Simply stick the vibrating part of the microphone to a crystal and, as pressure waves from your voice arrive, they'll make the crystal move back and forth, generating corresponding electrical signals. The "needle" in a gramophone (sometimes called a record player) works in the opposite way. As the diamond-tipped needle rides along the spiral groove in your LP, it bumps up and down. These vibrations push and pull on a lightweight piezoelectric crystal, producing electrical signals that your stereo then converts back into audible sounds. 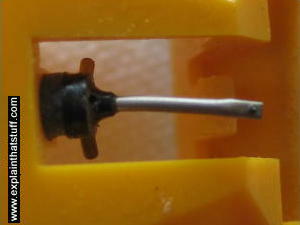 Photo: Record-player stylus (photographed from underneath): If you're still playing LP records, you'll use a stylus like this to convert the mechanical bumps on the record into sounds you can hear. The stylus (silver horizontal bar) contains a tiny diamond crystal (the little dot on the end at the right) that bounces up and down in the record groove. The vibrations distort a piezoelectric crystal inside the yellow cartridge that produces electrical signals, which are amplified to make the sounds you can hear. In a quartz clock or watch, the reverse-piezoelectric effect is used to keep time very precisely. Electrical energy from a battery is fed into a crystal to make it oscillate thousands of times a second. The watch then uses an electronic circuit to turn that into slower, once-per-second beats that a tiny motor and some precision gears use to drive the second, minute, and hour hands around the clock-face. Piezoelectricity is also used, much more crudely, in spark lighters for gas stoves and barbecues. Press a lighter switch and you'll hear a clicking sound and see sparks appear. What you're doing, when you press the switch, is squeezing a piezoelectric crystal, generating a voltage, and making a spark fly across a small gap. If you can make a tiny bit of electricity by pressing one piezoelectric crystal once, could you make a significant amount by pressing many crystals over and over again? What if we buried crystals under city streets and pavements to capture energy as cars and people passed by? This idea, which is known as energy harvesting, has caught many people's interest. Inventors have proposed all kinds of ideas for storing energy with hidden piezoelectric devices, from shoes that convert your walking movements into heat to keep your feet warm, and cellphones that charge themselves from your body movements, to roads that power streetlights, contact lenses that capture energy when you blink, and even gadgets that make energy from the pressure of falling rain. Artwork: Energy harvesting? Inventors have been filing lots of patents for wearable gadgets that will generate small amounts of electricity from your body movements. 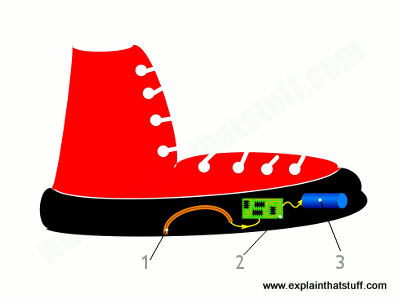 This example is a shoe with a built-in piezoelectric transducer (1) that springs up and down as you walk, sending electricity to a circuit (2) and then storing it in a battery (3). Is energy harvesting a good idea? At first sight, anything that minimizes waste energy and improves efficiency sounds really sensible. If you could use the floor of a grocery store to capture energy from the feet of hurrying shoppers pushing their heavy carts, and use that to power the store's lights or its chiller cabinets, surely that must be a good thing? Sometimes energy harvesting can indeed provide a decent, if rather modest, amount of power. The trouble is, however, that energy harvesting schemes can be a big distraction from better ideas. Consider, for example, the concept of building streets with piezoelectric "rumble strips" that soak up energy from passing traffic. Cars are extremely inefficient machines and only a small amount (15 percent or so) of the energy in their fuel powers you down the road. Only a fraction of this fraction is available for recovery from the road—and you wouldn't be able to recover all that fraction with 100 percent efficiency. So the amount of energy you could practically recover, and the efficiency gain you would make for the money you spent, would be minuscule. If you really want to save energy from cars, the sensible way to do it is to address the inefficiencies of car transportation much earlier in the process; for example, by designing engines that are more efficient, encouraging people to car share, swapping from gasoline engines to electric cars, and things of that sort. That's not to say that energy harvesting has no place; it could be really useful for charging mobile devices using energy that would otherwise go to waste. Imagine a cellphone that charged itself automatically every time it jiggled around in your pocket, for example. Even so, when it comes to saving energy, we should always consider the bigger picture and make sure the time and money we invest is producing the best possible results. The piezoelectric effect was discovered in 1880 by two French physicists, brothers Pierre and Paul-Jacques Curie, in crystals of quartz, tourmaline, and Rochelle salt (potassium sodium tartrate). They took the name from the Greek work piezein, which means "to press." A simple demonstration of piezoelectricity: Try piezoelectricity for yourself with a bit of help from by Dr Jonathan Hare and The Creative Science Centre. How to make a piezoelectric trumpet pickup: A fun Instructable uses piezoelectricity to convert old-fashioned trumpet sound into something more interesting. A Fitbit for the Stomach by Megan Scudellari. IEEE Spectrum, 11 October, 2017. Researchers develop a piezoelectric stomach sensor. Good Vibrations? California to Test Using Road Rumbles as a Power Source by Philip E. Ross. IEEE Spectrum, 19 April 2017. Could piezoelectric rumble-strips generate useful amounts of power? Given how much energy cars waste in converting fuel to motion, thinking about harvesting a tiny fraction of this energy could, itself, be a waste of (mental) energy. Energy harvesting fibre invented at University of Bolton: BBC News, 28 June, 2011. Flexible, piezoelectric fibers could be sewn into your clothes to charge your MP3 player or cellphone as you move around! Future Helicopters Get SMART: NASA, 25 February 2009. NASA scientists think piezoelectric blades could make helicopters quieter and more economical. A step closer to self-powered kit: BBC News, 4 December, 2008. Describes how small, piezoelectric generators could be used to make a variety of self-powered gadgets. Implant may help deaf hear music: BBC News, 19 October 2005. How piezoelectric materials are being used in new cochlear implants to improve deaf people's hearing. Piezoelectric Materials: Applications in SHM, Energy Harvesting and Biomechanics by Suresh Bhalla, Sumedha Moharana, Naveet Kaur, and Visalakshi Talakokula. Wiley/Athena, 2017. An up-to-date introduction that connects theoretical aspects of piezoelectricity with practical applications in medicine and energy production. Piezoelectric Ceramics: Principles and Applications: APC International, Ltd. 2011. A pithy (114-page) introduction to the principles of piezoelectricity and how it's used in different kinds of generators, sensors, actuators, and transducers. The Beginnings of Piezoelectricity: A Study in Mundane Physics by Shaul Katzir. Springer, 2011. A fascinating historical account of how the piezoelectric effect was discovered and explained by a variety of different theories and models. Piezoelectricity: Evolution and Future of a Technology by Walter Heywang, Karl Lubitz, and Wolfram Wersing. Springer, 2008. What is piezoelectricity and how can we apply it in medicine, defense, and other important areas of society? US Patent: US 20140128753 A1: Piezoelectric heart rate sensing for wearable devices or mobile devices by Michael Edward Smith Luna et al, 8 May 2014. A cutting-edge sensor that can monitor your heart and send details to your cellphone (or similar mobile device). US Patent: 8,087,186: Piezoelectric-based toe-heaters for frostbite protection by ‎Jahangir S. Rastegar, 3 January 2012. These shoes use piezoelectric materials to convert the repeated squashing and stretching of your shoes into electrical energy that can warm your feet. US Patent: 20050127677: Roadway generating electrical power by incorporating piezoelectric materials by Jeffrey Luttrull, 16 June 2005. Describes a method of harvesting energy from roads. US Patent: 8,278,800: Multi-layer piezoelectric generator by Haim Abramovich et al, Innowattech, 2 October 2010, is a variation on the same basic idea with more details of how road generators would actually work. US Patent: 4,685,296: Ocean wave energy conversion using piezoelectric material members by Joseph R. Burns, 11 August 1987. In this invention, piezoelectric materials generate electricity from the up-and-down movements of ocean waves. US Patent: 5,598,196: Piezoelectric ink jet print head and method of making by Hilarion Braun, Eastman Kodak, 28 January 1987. 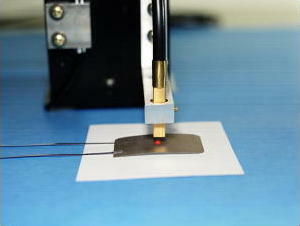 An inkjet print head that squirts precise droplets of ink using piezoelectric materials.